Amazon’s teeny tiny Echo Dot speaker is the cheapest way to get Alexa, the ground-breaking virtual personal assistant that’s currently taking the world by storm. At $49.99, it’s $130 less than the original Amazon Echo, and $90 less than the portable Amazon Tap. Every so often, however, Amazon holds a sale that makes the Dot even more affordable, and one such sale just kicked off today. Buy three Echo Dots in any color and use the coupon code DOT3PACK at checkout, and you’ll save $20 on your order. 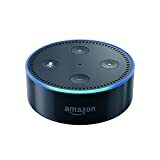 That drops the price of each Echo Dot to just over $43, which is a killer deal, and the code will only work through the end of the day on April 25th. Also, if you want to turn one or all of your Echo Dots into portable Alexa speakers that don’t have to be plugged in, definitely check out the the Fremo Evo.